This article explains how you can get a kidney transplant, and how this procedure is performed. kidneys. Since 1986, OPTN has been managed by the United Network for Organ Sharing (UNOS), a private, non-profit organization. A transplanted kidney works like a normal kidney, operating continuously. You may feel healthier than you do on dialysis. Your diet will have fewer restrictions. Patients tend to live longer with a successful kidney transplant. On the other hand, kidney transplantation does involve certain risks. First, any abdominal surgery involves risk. If someone has chosen to donate a kidney to you, than there is risk associated with the donor’s surgery as well. Plus, your immune system could reject (attack) the kidney transplant. You will be prescribed anti-rejection (immunosuppressant) medications to prevent your immune system from attacking the kidney. You will need to take those medications for as long as you have that kidney. But those medications—by suppressing the action of your immune system to some degree—will also leave you more vulnerable to infection and cancer. The medications can have other side effects as well. Finally, the transplanted kidney may not last you the rest of your life. It may fail after 10 or 15 years (or even in less time under certain conditions). After that, you will either have to get another kidney transplant or go back on dialysis. The transplant coordinator supervises all the details of your transplant. His or her duties include: Explaining kidney transplantation to you and your living donor (if you have one); explaining to you what to expect, how to prepare for the transplant procedure and what you will need to do afterward; and scheduling your pre-transplant evaluation. The pre-transplant evaluation is a process that will evaluate your eligibility for a transplant. As part of your pre-transplant evaluation, you may meet with a transplant psychiatrist, who will evaluate your mental health status. The transplant social worker can assist you with any special requirements, such as paying for the transplant or arranging for transportation to and from the hospital. The transplant surgeon will perform the transplant procedure. The transplant nephrologist will treat you after the transplant procedure: Examining you, prescribing medications for you and evaluating your progress. The transplant dietitian will assist you with changes to your diet post-transplant. If someone has volunteered to be your living donor, he or she will be evaluated by your transplant team to determine if he or she is a suitable candidate for kidney donation. Generally, not just anyone can be your kidney donor. Your donor’s kidney has to be compatible with your immune system; that is, your immune system should not have normally occurring antibodies against antigens carried by the donor. Blood typing and tissue typing are performed to check this. If it should turn out that your prospective living donor’s kidney is not compatible with your immune system, you may still have options. Some hospitals have started to offer programs for relatively incompatible kidney transplants from living donors. In an ABO-incompatible kidney transplant, the donor’s blood type is not necessarily compatible with that of the recipient. Various treatments are used to reduce the chance of an immune reaction from the recipient. This type of transplant is easier with recipients who are young children, whose immune systems aren’t fully developed yet. In adults, this type of transplant has a higher risk of transplant failure. Alternatively, perhaps your donor’s kidney is compatible with the immune system of some other recipient who might know of a compatible living donor for you. If so, then your donor could donate his or her kidney to that other recipient, and that other donor could donate his or her kidney to you. This is called a paired kidney exchange; or more commonly, a “kidney swap.” An example is shown in the figure, in which the husband of the first couple donates a kidney to the wife of the second couple, whose husband donates a kidney to the wife of the first couple. UNOS runs a pilot Paired Kidney Exchange Program to arrange kidney swaps between pairs of people. Your hospital may be able to register you with that program. You can also register with the National Kidney Registry, a non-profit organization, which arranges kidney swaps. There are more patients waiting for deceased-donor kidneys than there are kidneys available. The waiting time for a suitable kidney can be years. For this reason, it is advisable to get on the waiting list for a kidney transplant as soon as possible. After the transplant procedure, you will remain in the hospital for up to a week until you are well enough to be discharged. Thus it is important that your family and employer be prepared for you to be admitted to the hospital for up to a week without warning. Unless your own kidneys are posing sufficient risks to your health that they must be removed, they will be left in place. 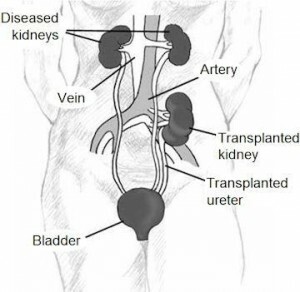 The transplanted kidney—often called the graft—will be placed in your abdomen below where your own kidneys are. (A typical location for the graft is shown in the figure.) Yes, when the surgery is completed successfully, your body will have three kidneys. Your risk of infection will be highest in the first year after transplant. You will have regular blood tests to check how well the graft is performing and to monitor the level of immunosuppressant medication in your bloodstream. Initially, your dose of immunosuppressant medication will be high, but your transplant team will try to taper it down over that first year.After your kidney transplant, you will remain in the hospital for from four to seven days, until your doctors are sure that the graft is working well enough and that you are well enough to be discharged. Your transplant nephrologist will prescribe anti-rejection (immunosuppressant) medications for you, to prevent your immune system from rejecting your kidney. But those medications may also reduce your immune system’s ability to fight infections. You will need to be more careful about avoiding disease-causing germs. Your transplant team will supply you with a set of guidelines about getting vaccinated against dangerous infections and avoiding unnecessary exposure to germs. Kidney transplantation is abdominal surgery. To speed your recovery from this surgery, you must avoid straining your abdominal area. You will not be able to drive a car, lift objects weighing more than ten pounds, or do anything else that might strain your abdominal area until your transplant team has determined that your surgery has healed sufficiently. This can take four to eight weeks or so. In the meantime, your family and friends may have to take over some of your chores and errands, and drive you wherever you need to go. Or you can hire a professional caregiver to help you. Your diet after transplant will be closer to a normal diet than the renal diet is (see article #31). Instead of the fluid restrictions that accompany dialysis, now you will likely be encouraged to drink as much water as you want. Your transplant dietitian may also want you to increase your intake of calcium. Avoid consuming grapefruit or grapefruit juice, because these foods can interact with some of your anti-rejection medications. Use caution with foods that might increase your chance of infection. Avoid salad bars and sushi.